Manchester City forward Gabriel Jesus has put pen to paper on a new contract worth more than £25m. According to the Mail Online Jesus will earn over £100,000 a week. News of Jesus’s new deal comes only 4 months after another report by The Mail which claimed the striker had rejected a new deal worth £90,000 per week. 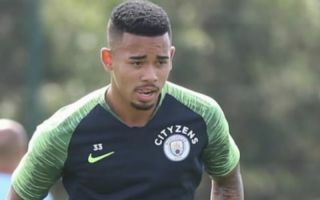 21-year-old Jesus officially joined the Citizens from Brazilian club Palmeiras in January of 2017 and has since gone on to make a significant impact for the team. Jesus has contributed 20 goals and 7 assists in just 39 Premier League appearances. “I would like to thank the fans for the welcome and for how well they have treated me. I can say that it was the best decision I’ve made in my life to come to Manchester City because whilst I’m here I’m improving as a professional and as a person. Following Manchester City’s title winning season, Guardiola and Co. will be looking to become the first team to win the Premier League in consecutive seasons since rivals United in 2009. The renewal of Jesus’s contract signals City’s intent on building a team that can dominate for many years to come.